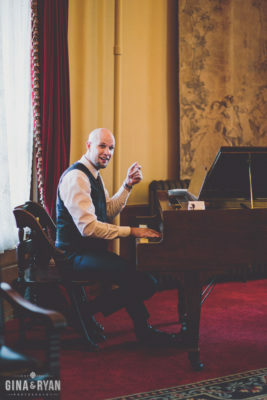 As a professional pianist for over 25 years and having performed at more weddings than I can count, I have come to realize that I have valuable information I can share with brides, grooms and anyone involved in the planning of a wedding. I play around 20 weddings every year and while each wedding is unique, there is a lot of planning involved in each of them and there are certain things that every couple will want to consider. Here are my suggestions as it relates to the music element of your wedding – don’t underestimate the importance of this piece! 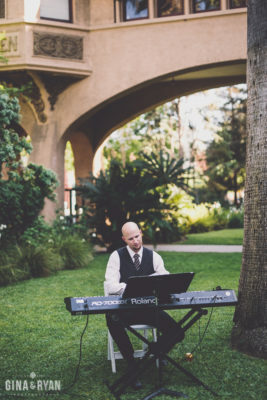 With most weddings having these four distinct parts, there are four opportunities to distinguish those elements and create a unique mood for each with the music. For example, you could have live musicians for the ceremony and cocktail hour and have a DJ handle dinner and dancing (with different types of music played). Personally, as live music providers, we feel that the ceremony is the most important part where it is ideal to have live musicians playing. Your wedding ceremony is so intimate and personal, it just doesn’t feel right to have an iPod do the job. Your choice of venue may also provide opportunities or limitations for different types of music. You will want to find out what (if any) sound equipment they provide. 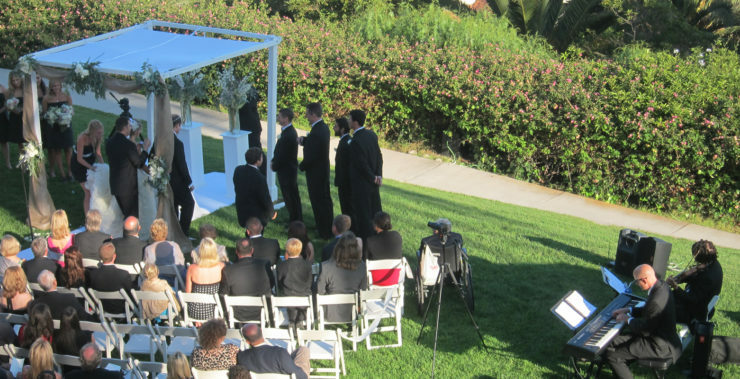 Do you need to provide all your own equipment such as microphones and amplification for the ceremony? Do they have an existing sound system that a DJ can plug into? Maybe they have a grand piano on site in the area where you’ll be having cocktail hour; why not use it? The venue may also have restrictions on amplified music after a particular time. These are all good things to find out in advance so that you can begin to visualize the possibilities and know the types of services and equipment you will need from vendors. Most of the time when I am hired to perform at a wedding, it is for the ceremony or cocktail hour or both. If I am playing for both, most likely the venue has a piano which makes this logistically feasible. With the ceremony often taking place outside, I will bring my keyboard and sound system for that portion. In doing this, I can also provide microphones for the ceremony if needed. After the ceremony, as the guests migrate to another location for cocktail hour, I will quickly move to that location and most likely play on a piano that is provided at the venue. Some of the venues that we love working with that make this type of arrangement possible are: Carondelet House, The Ebell of Los Angeles, Castle Green, Cicada and Bel Air Bay Club. I really recommend hiring professional musicians who have experience with weddings. This is critical because they will know how to adjust timing if things aren’t running according to schedule and to look for cues from your wedding coordinator. Speaking of which, it is always a good idea to have someone designated to provide cues to musicians or DJs for a seamless performance. The bottom line is that experienced professionals will know how to roll with the flow of your wedding and make things appear to be running smoothly so that the guests won’t notice any hiccups if they happen. I’ve attended some weddings were the musicians were clearly not used to playing weddings or, in some cases, not a tight group in synch with each other and it was blatantly obvious. Our company, Weinglass Music, works with outstanding musicians and we can create ensembles or provide soloists based on what you desire. And, if what you are looking for isn’t our specialty, we will refer you to someone who can help you. Choosing the Perfect Songs for YOU! Weddings are an emotional event with many layers and music is the perfect way to capture that emotion and creatively express yourselves. Look for opportunities to personalize and choose songs that are special to you as a couple. Or maybe you could incorporate your cultural, family or ethnic heritage if that is important to you. It can also be a way to highlight and embrace the marrying of your different backgrounds, if applicable. My business partner, Kim, works with our clients to tailor the music for their wedding according to their wishes. From the prelude before the ceremony all the way to the reception, we can provide you with an outline to guide you through the process of selecting music for key moments throughout. Whether you know exactly what you want, or if you have no idea and would like some suggestions, we will help you create the perfect soundtrack for your special day. If you are looking for ideas or inspiration, take a listen to some of these songs which all work beautifully in different parts of a wedding. Sometimes people have a family member or friend that they want to sing a special song. That’s great! But, it is also extremely beneficial to have that person accompanied by an experienced musician in the wedding business. As a pianist, I often accompany singers and in these cases my role is to make your friend or family member shine! I would say that in most cases, it is far better to have someone sing with live musical accompaniment vs. a recorded track. When I accompany singers, we talk through details such as the arrangement and key over the phone or email. Then, if the singer lives locally and it’s possible, we’ll get together for a rehearsal a few days before the wedding. If that’s not possible, we may rehearse over video conference or at the wedding rehearsal or on the wedding day. Here’s a video of me accompanying a friend of the bride and groom singing the song for their first dance. OK, Now Who to Hire? Don’t leave hiring musicians to the last minute! Sure, it’s possible that you could find someone great available, but if you wait too long, you might be stuck finding someone simply based on availability. For weddings, people often book me a year or more in advance. We always say it’s never too early to start planning! These links will take you to my profile pages, but you can search for others as well. Have you been to a wedding where the music really stood out? Ask that couple for referrals. Your wedding venue likely has a list of preferred vendors. Check with them to see who they recommend. If you are working with a wedding planner, ask them for referrals to musicians that they have worked with. Have you seen any musicians performing live in the area of your wedding that you enjoyed? See if you can find them online. Always check out the musician’s website and look for audio and video samples of them performing so you can get a sense of their abilities and style. Also look for reviews from past clients. If they don’t have these things, I would think twice about hiring them because they likely do not have much experience. Of course, Kim and I would love to work with you and we are happy to help any way we can! Contact us to see if I am available or if you have another type of music in mind, don’t hesitate to ask if we have a recommendation – it’s quite likely that we do!